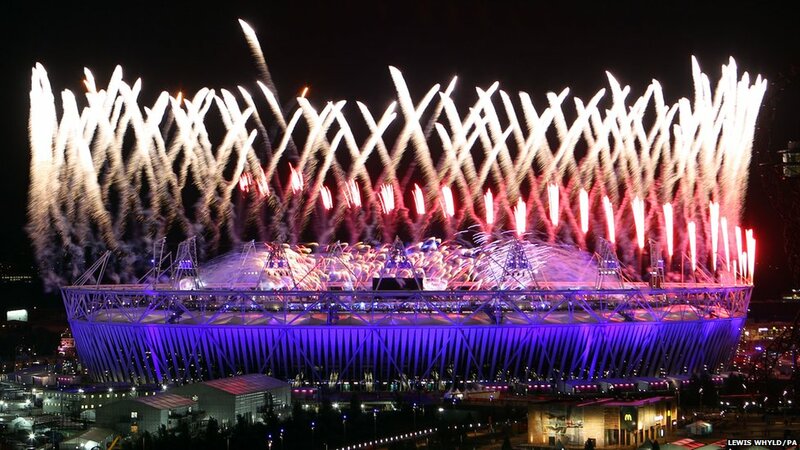 The Queen has declared the London Olympics open following a spectacular ceremony, featuring David Beckham, Bradley Wiggins and Daniel Craig as James Bond. 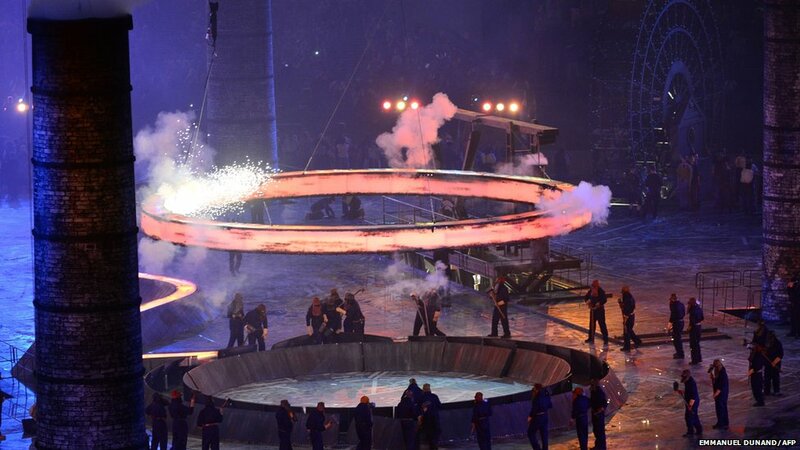 Seven young athletes were given the honour of lighting the ceremonial flame which is formed from 204 copper petals carried in by teams from across the world. 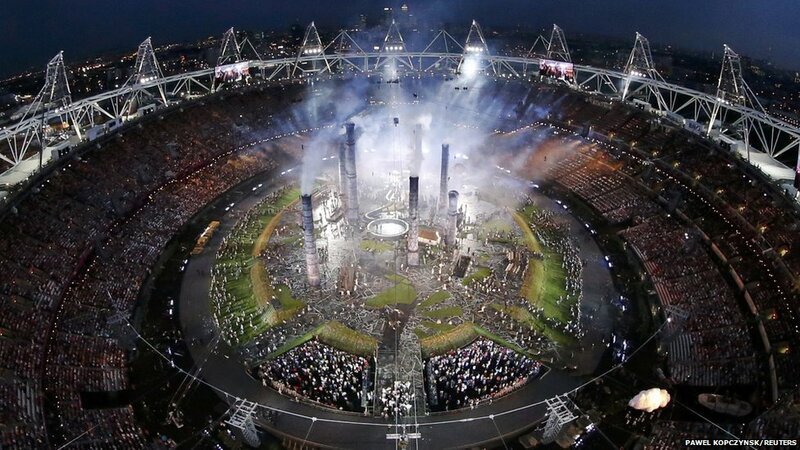 Games chief Seb Coe welcomed the world to London, saying the event celebrates "what is best about mankind". 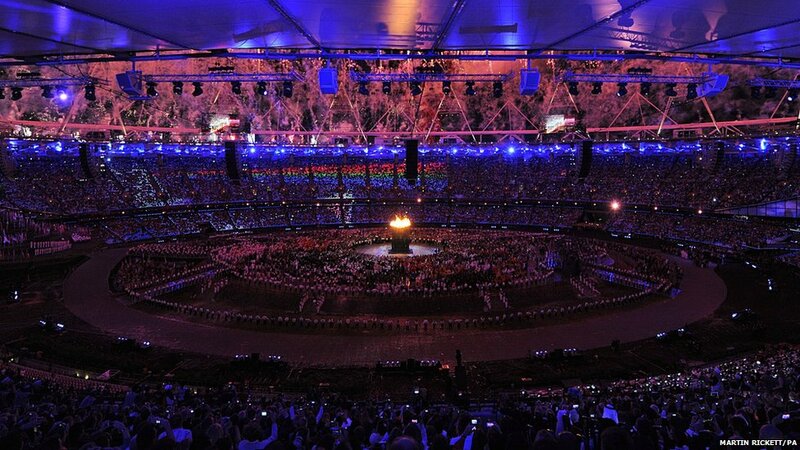 The three-hour spectacle, a quirky take on UK life, was viewed by TV audiences around the globe. 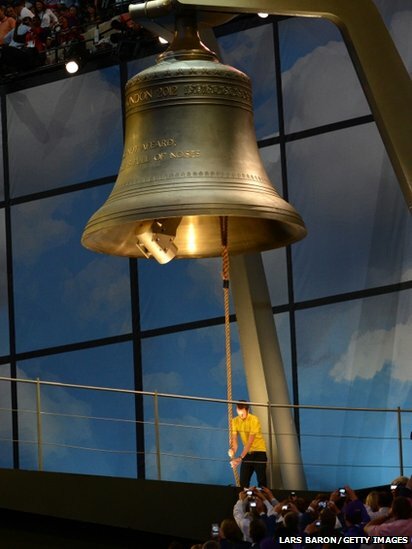 Cyclist Bradley Wiggins, wearing a yellow jersey, rang the largest harmonically tuned bell in the world to start the show. 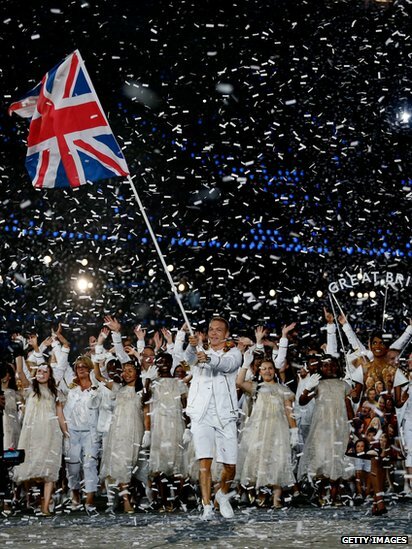 Flag-bearer Sir Chris Hoy led out Team GB, who were dressed in white and gold tracksuits, to loud applause. 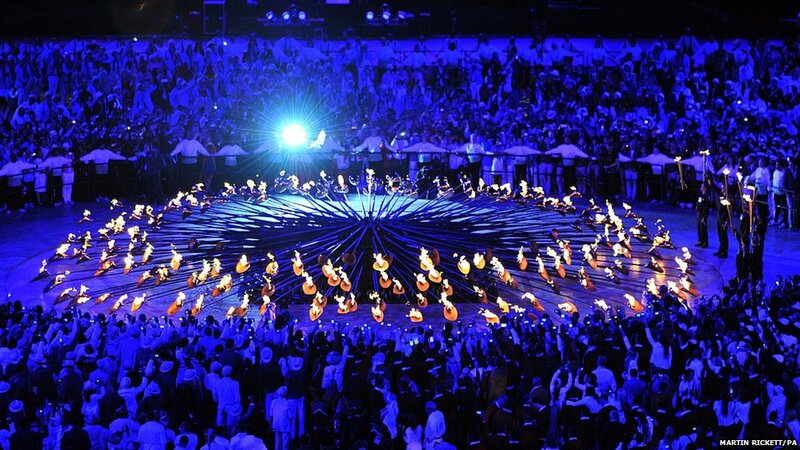 The athletes taking part in the Games - led, as tradition dictates, by the Olympics' spiritual home Greece - made laps of the stadium bearing their nations' flags. 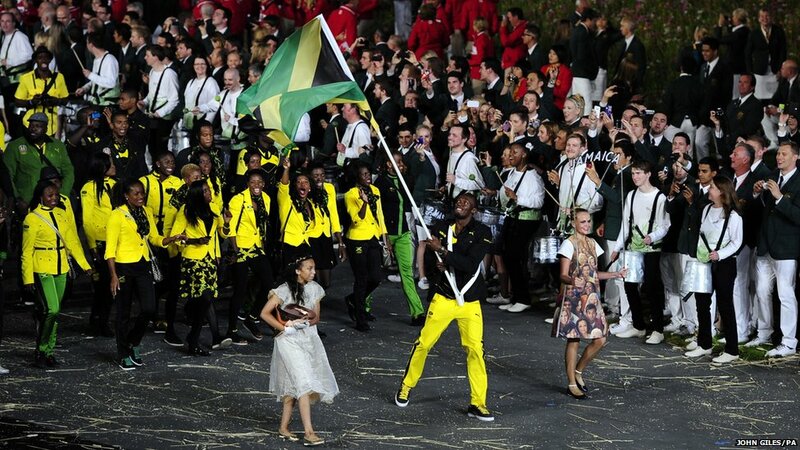 There were huge cheers for the Irish team - and for Usain Bolt, who carried the flag for Jamaica. 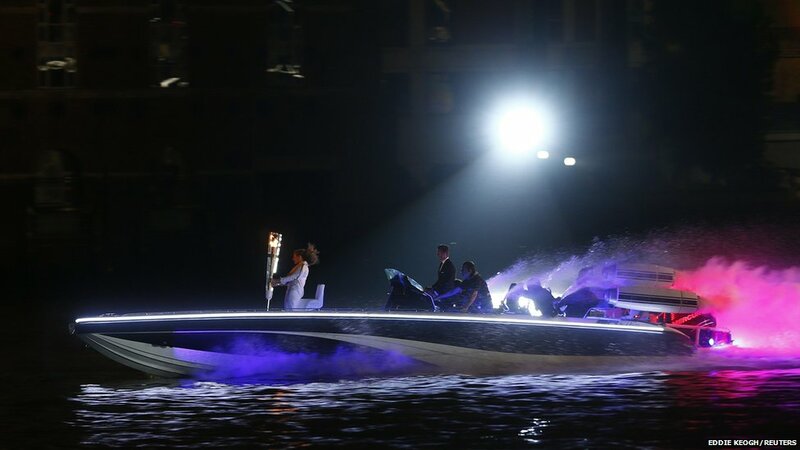 David Beckham took to the Thames with the Olympic Torch, making his way to the stadium by powerboat. 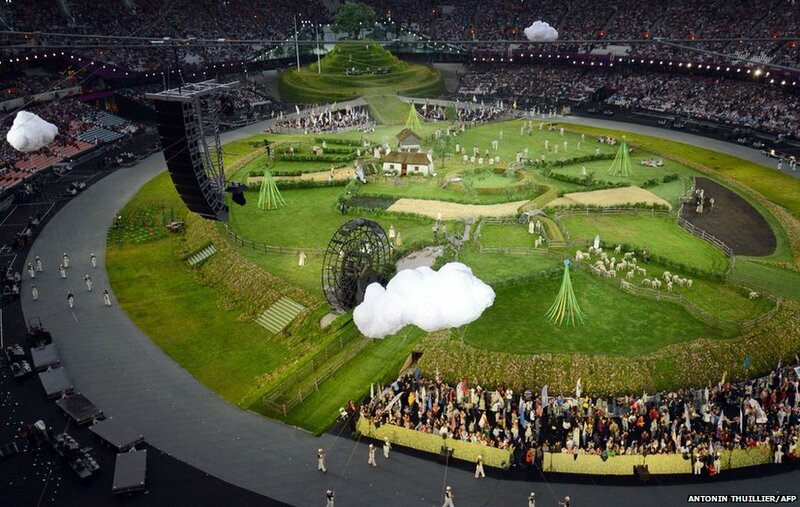 All four countries of the UK were represented in song, as the show capturing the best of Britain began. A classical orchestra sitting on the grass played Elgar's Nimrod. 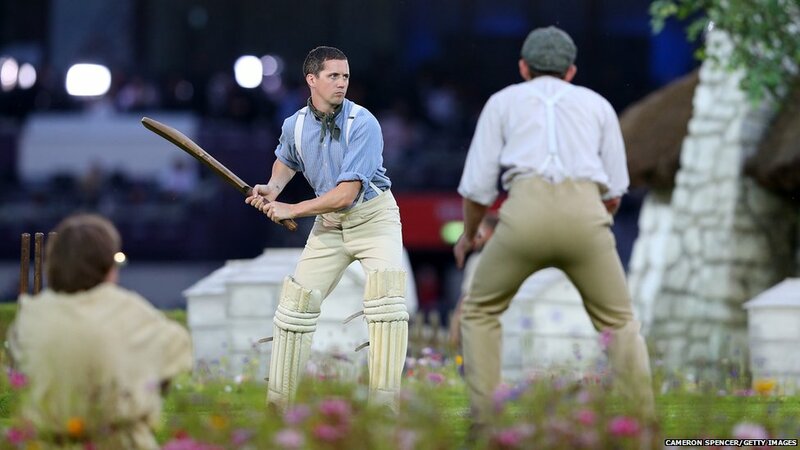 A turning waterwheel and a game of cricket completed the pastoral scene. A video of James Bond - actor Daniel Craig - meeting the Queen at Buckingham Palace was broadcast to the audience. 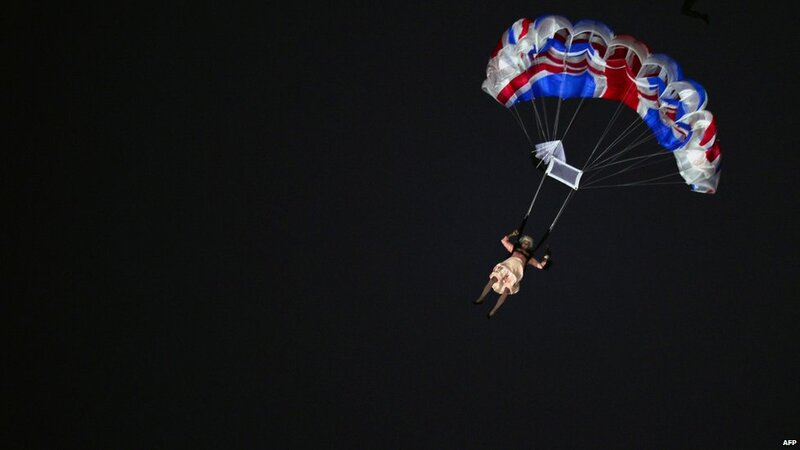 A helicopter then flew over the stadium to the sound of the Bond theme tune, as two figures parachuted out of the helicopter, one dressed as the monarch. 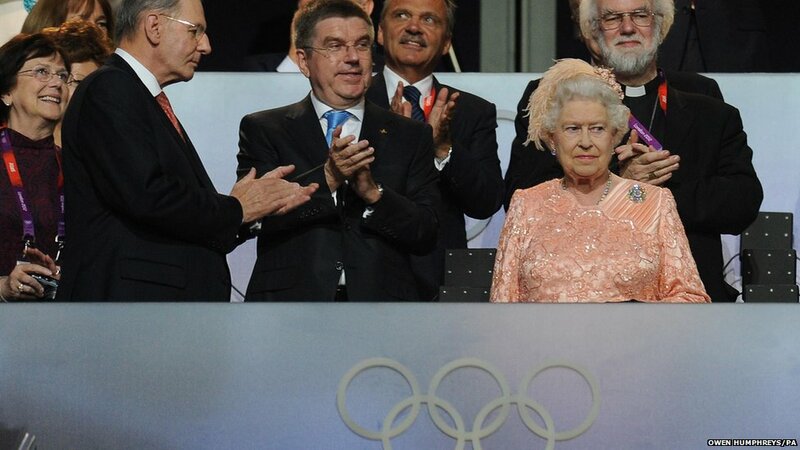 As if by magic, the Queen appeared in the stands at the stadium - part of a crowd of about 80,000 - amid cheers. 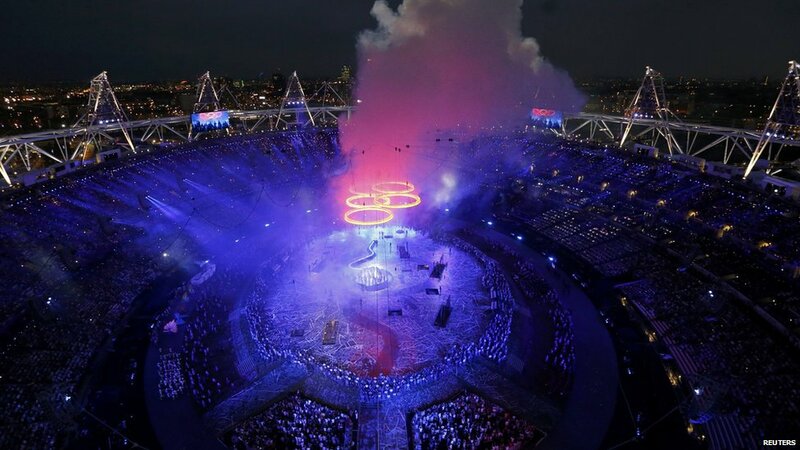 The artistic director, Danny Boyle, pledged a ceremony with a theme of "this is for everyone". 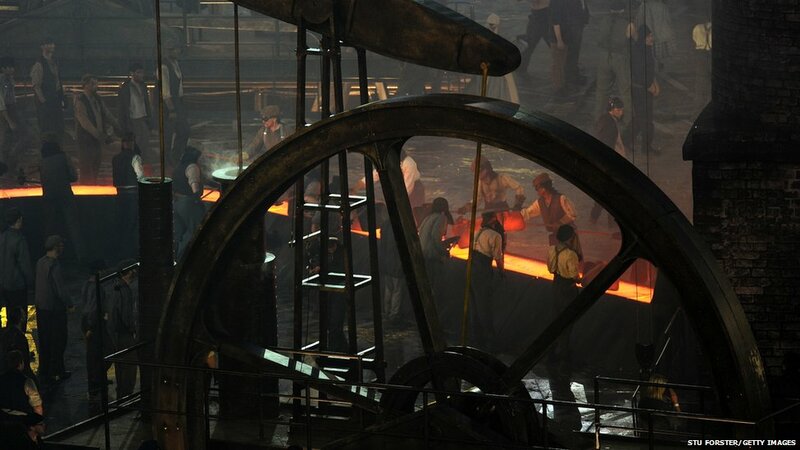 The show took viewers through "great revolutions in British society", from an agricultural setting through to the Industrial Revolution. 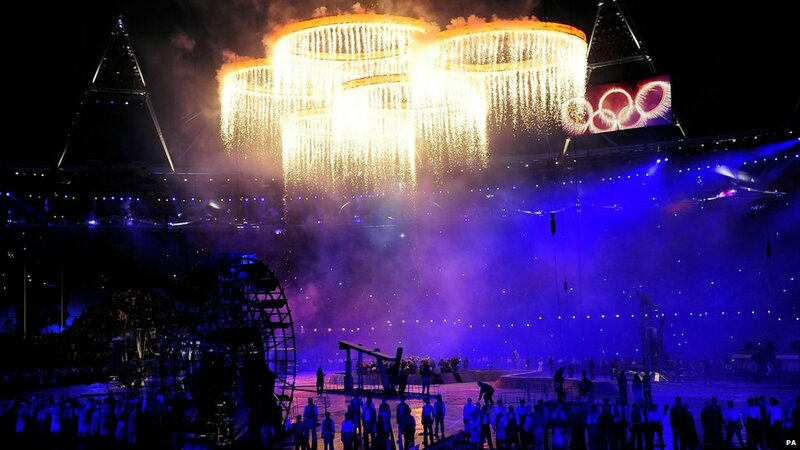 Steelworkers began forging material that transformed into golden Olympic rings, which lifted into the air to be suspended above the performers. The Oscar-winning film director added that it contains "a celebration of the creativity, exuberance and, above all, the generosity of the British people". 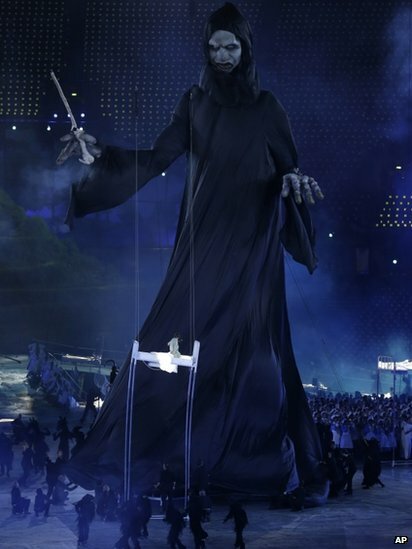 He said there were to be "no spectators - everyone in the stadium will be part of the magic". 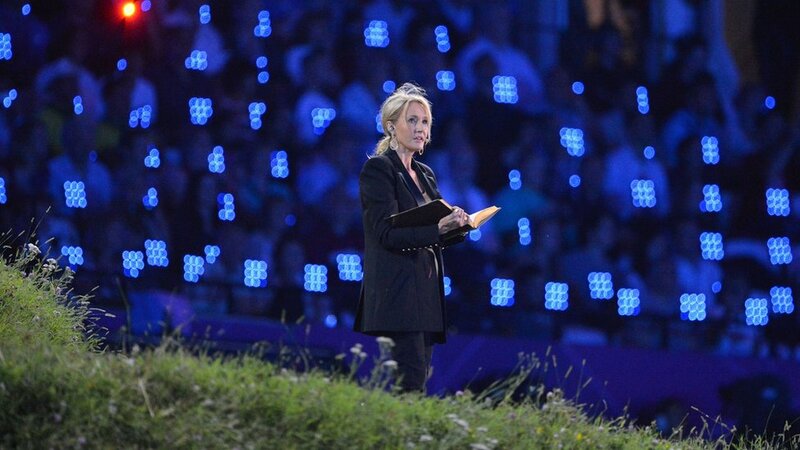 One sequence - during which author JK Rowling delivered a reading - entitled "Second to the right, and straight on till morning", honoured "two of Britain's greatest achievements: its amazing body of children's literature and the NHS". Spectators lucky enough to get tickets to the Olympic Stadium event braved the rain despite forecasters predicting dry weather. 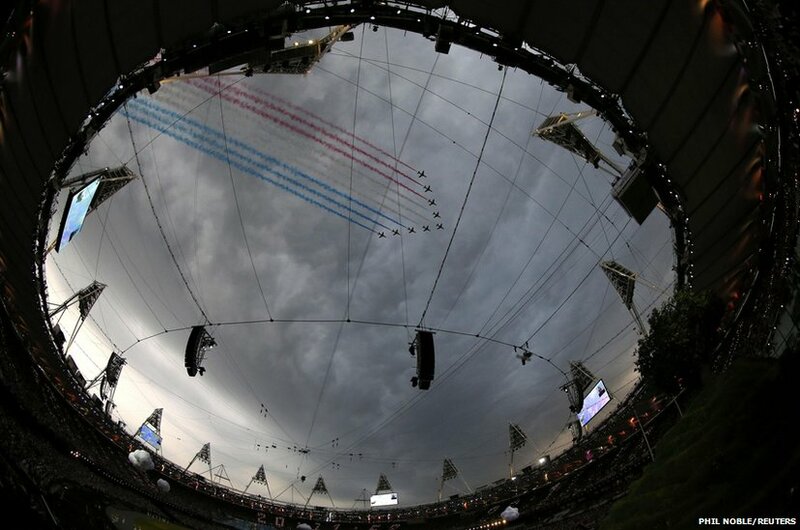 A Red Arrows fly-past marked the start of the pre-show at the symbolic time of 20:12 BST (19:12 GMT).